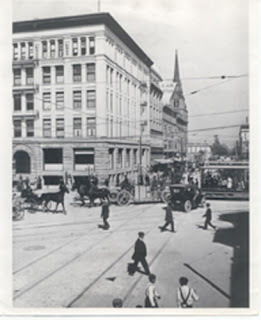 Oakland, founded in 1852, is the eighth-largest city in California. It lies on the eastern shore of San Francisco Bay, nestled against the Berkeley Hills and bordering five of the East Bay Regional Parks. To Oakland's north is Berkeley, home to the renowned University of California, Berkeley, and to its west across the Bay Bridge is San Francisco. Oakland is located in the San Francisco Bay Area, the sixth most populated metropolitan area in the United States. The Bay Area has a population of over 7 million. As of 2007, Oakland's population was 415,492, making it the third-largest city in the San Francisco Bay Area, after San Jose and San Francisco. Major employers in Oakland include the local, state, and federal governments, United States Postal Service, the Port of Oakland and carriers associated with the port, regional transportation and utility authorities, Kaiser Permanente (health care), Clorox, Dreyer's Grand Ice Cream, Ask.com and commercial bakeries.